Our 11B envelopes Measures 90 x 145mm. They hold our RSVP cards, Thank You cards and fit perfectly in our range of pocket fold invitations. 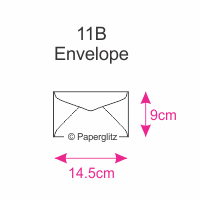 Our 11b envelopes are the smallest standard size accepted by Australia Post. Smaller envelopes attract higher postage rates. We also carry this colour envelope in the following sizes : C6, DL, C5, 130x130mm Square, 160x160mm Square & 5x7 / 130x185mm..
Buy with confidence and specify only "Genuine Paperglitz 11b Envelopes" for your next project.